San Francisco is the city veiled in fog, surrounded by the Pacific Ocean, known for its precipitous hills. Now, more often than not, the city is uttered in the same breath as Silicon Valley, skyrocketing rent prices and “those darn millennials.” These things aside, current residents, and indeed, many of those who have left their hearts in San Francisco at one time or another, may be astonished to learn that the a double-decker freeway once encircled the city’s downtown area and separated the city from its glistening bay. This freeway, the California State Route 480, also known as the Embarcadero Freeway, was irreparably damaged during the Loma Prieta earthquake in 1989, and the elevated roadway was razed. 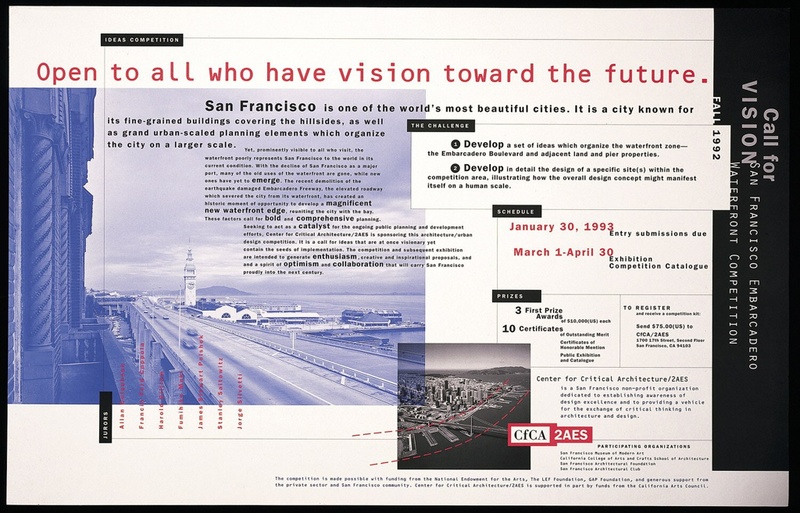 One year after the demolition of the freeway, 2AES: The Art and Architecture Exhibition Space—the city’s alternative exhibition space modeled after New York’s own Storefront for Art and Architecture—launched a competition to envision how the Embarcadero could be transformed. Through the proposals gathered in this competition, San Francisco’s waterfront could again become the intimate linkage point between city and bay. One can’t help but imagine the layered, often hidden-in-plain-sight histories of San Francisco in the relationship between photograph, text, and type of Tenazas’s signature style, epitomized here in this poster. Kristina Parsons is a former MA Fellow in the Drawings, Prints & Graphic Design Department at Cooper Hewitt. She is currently working with Design Programming at Artsy. Gilliam, Harold. “Quest for Vision: A San Francisco Waterfront Design Contest Brings out the Wild, the Weird and the Wonderful in Urban Design — plus One Amateur Judge among the Pros.” The San Francisco Chronicle (San Francisco), March 7, 1993. Accessed March 12, 2016. Hi there! I just wish to give an enormous thumbs up for the nice information you have got here on this post. I might be coming again to your blog for extra soon.